Sending text messages and emails to your people during an emergency is not enough. Technology and government regulations have moved emergency notifications from just text and email to a countless number of ways to alert your people. As our culture’s approach to handling emergencies have changed, so must our communication methods. Implementing multiple endpoints in real time is now the new standard. Minimize risk and maximize your preparedness with the knowledge necessary for keeping your community safe. 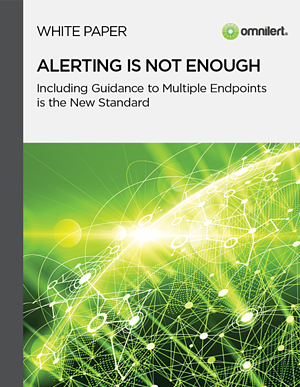 Download the free ‘Alerting is Not Enough’ white paper.